Although Haley’s grandparents, aunts, uncles, friends, and neighbors probably already know that she has been born, it’s never “official” until the birth announcement arrives in the mail. My good friend, the Fed-Ex driver, stopped by this morning with these announcements that I custom-designed after her photography session, and I could hardly get them opened fast enough. She’s a yummy little bundle of love. See for yourself! When I found out that I was going to get to photograph Tracy and Ryan’s new baby, I could hardly wait, but I had to. See, my family was leaving on vacation just a few days after she was born, and we simply couldn’t squeeze in an appointment before we left. 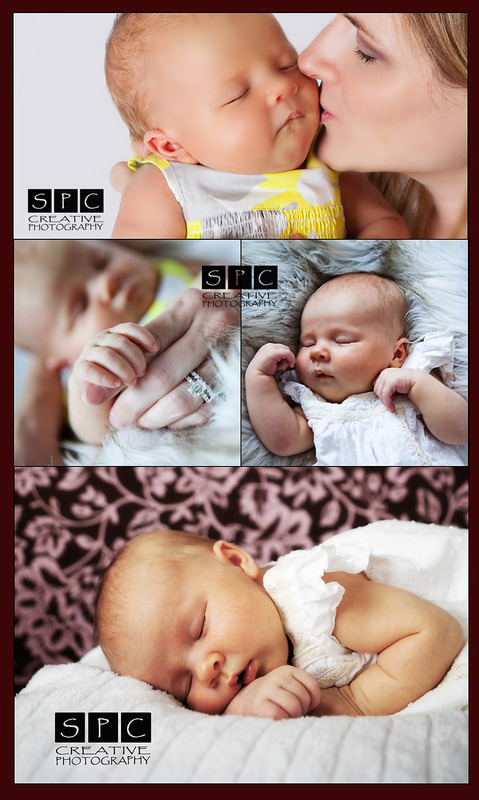 So, Miss Haley was just over 3 weeks old when she came for her session. STILL, it was her first outing, and she and her mommy handled it like true pros. I look forward to watching this little beauty (and her adorable big sister) grow up. Here are a few more images from our session. Yeah, I think Miss Haley has STAR qualities, ANGEL qualities, and most definitely SQUEEZABLE qualities !